Ticks are a very big concern this year! We’ve written about them before, but things are much worse since we first started seeing them a few years ago. Tick, talk, tick talk…it’s time for an update about ticks! Many parts of Ontario are now considered a risk area for Lyme disease. Check out Public Health’s map of risk areas in Ontario below. It’s not the kind of map any city wants to be on, but the deer tick has been found in sufficient numbers in parts of Toronto, to put us on it. Where there’s a black-legged (deer) tick, there’s the potential for that tick to carry the bacterium (Borrelia burgdorferi) that causes Lyme disease. Note: It’s still the case that nation- & province-wide, about 1 in 5 deer ticks carry Borrelia burgdorferi. But in certain areas where these ticks have been established for a number of years (like Kingston & Gananoque), as many as 40% of them carry Borrelia. Any day it’s 4ºC or higher, ticks come out of hiding in search of a meal. 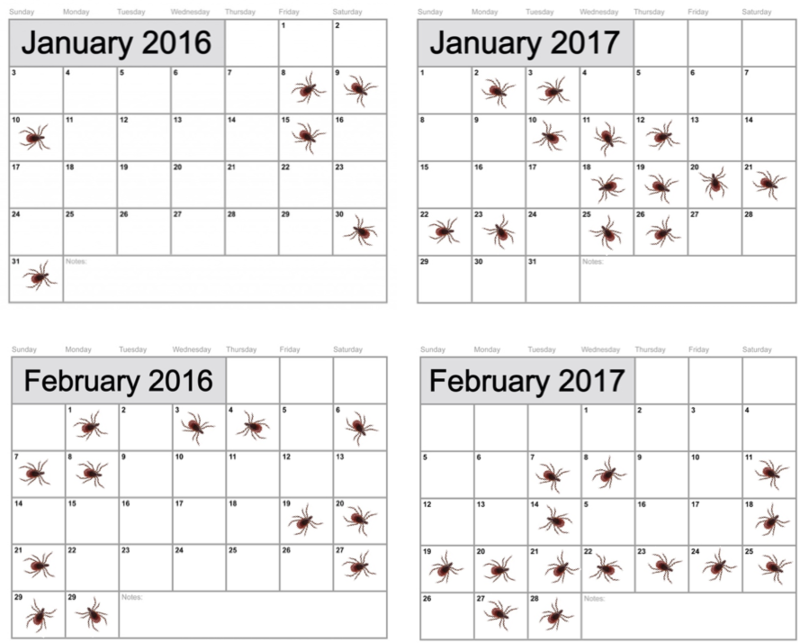 Click the calendars below to see the days in January & February that supported tick-friendly temperatures. In January & February of 2016, that represented 19% & 41% of the month, respectively. That went up to 41% in January & 50% in February this year. So, in the dead of winter, ticks aren’t playing dead any more. Given that winter months here continue to see temperatures that support tick activity, year-round tick protection makes good sense to ensure your dog is covered during those warm spells that are becoming a norm through the winter. Tick-borne diseases such as Lyme disease are preventable! Bravecto® continues to be most vets’ ‘go to’ for tick prevention. It’s safe, effective (it kills ticks before they have time to transmit Borelli burgdorferi), & it lasts 3 months. That means fewer treatments per year & fewer gaps in treatment. Read on to further understand the risk ticks present & to learn how to identify the ticks of greatest concern & take steps to reduce the risk of acquiring tick-borne diseases so you & your dog can continue to enjoy the outdoors in good health. What exactly is a tick and why are ticks a concern? Once on board, some ticks wander around looking for the best seat in the house (like on or near an ear where skin is thin). Others will settle in wherever they land. They’re pretty hungry at this point & literally do a face plant when they feed, embedding their heads into skin & sucking up blood through a feeding tube for several days. Once they’ve had their fill, they fall off their host & move on to their next life stage. You’d think we hosts would notice, but ticks are really small (hard to see until they’re engorged with a blood meal) & some species release a kind of local anesthetic when they feed so their hosts don’t notice they’re there. The easiest way is by looking at the shield on their backs called the scutum. The scutum covers the entire back of males but only the upper back of females. It is solid black in black-legged ticks & more “ornate” with some white in American Tick scrutumdog ticks. (Brown dog ticks don’t have a distinct scutum.) That said, ticks are small, so even identifying them by their scutum is challenging. At any point that you’re seeing an area on the ground without snow cover and the temperature is 4°C or higher (let’s say above freezing to be safe), ticks will be out questing for a meal. In our part of Ontario, people and their pets need protection from March through November at a minimum. But given the consistent warm spells we’re seeing during our winter months, it’s time to consider year-round protection. Adult ticks are active in the spring and fall. Nymphs are active during the summer. Nymphs pose the greater risk to people because they’re around at a time when people are wearing shorts & tee-shirts & have more skin exposed, and nymphs are so tiny (1-2 mm in diameter!) they’re hard to spot. There’s a nifty 2-pronged tool for the job that we sell you. Or, you can buy one from Pet Smart. 1) Pick the large or small one depending on the size of the tick. 2) Engage the tick between the prongs of the tool approaching it from the side. 3) Gently lift & turn (clockwise or counterclockwise) until the tick releases its hold. 4) Disinfect the bite site and wash your hands. Alternatively, grasp the tick close to the skin with tweezers and gently but firmly lift upward. The goal is to remove the tick with its mouth parts intact. (If you leave anything behind it’ll cause a reaction under the skin.) DO NOT put oils, Vaseline, or other concoctions on the tick (we worry that it’ll cause the tick to regurgitate into its host – exactly what we don’t want!). On average, about 1 in 5 black-legged ticks in Ontario carry the bacterium (Borrelia burgdorferi) that causes Lyme disease (less in some areas, more in others). (In areas such as Kingston & Gananoque, up to 40% of ticks are carrying the bacterium.) The vast majority of dogs that are exposed to Borrelia don’t get sick. In fact, only about 5% of dogs develop symptoms of Lyme disease: a lameness that shifts from one leg to another, fever, lethargy, and a loss of appetite. And they can be treated successfully with antibiotics. But left untreated, about 1% of those that get sick develop Lyme nephritis (an immune-mediated disease of the kidneys that’s often fatal). People can also develop serious complications of Lyme disease if it’s not treated. So if you develop flu-like symptoms (aches, pains, headaches) or a bulls-eye-like or other rash where you may have been bitten by a tick, please see your family physician. While Lyme disease is serious, it’s also entirely preventible if you take the appropriate precautions.